Angie runs her late aunt's Amish Quilt shop. As an Englisher, Angie has made several Amish friends in the area, though there are still those who are skeptical including Martha Yoder who cared for Angie's late aunt. Martha has since opened a 'true Amish' quilt shop right next door to Angie! Angie decides to sell some of her aunts quilts in the local Amish auction to help make the quilt shop payments.As the first Englisher to sell at the auction, Angie wants to make sure everything goes smoothly so she can continue and perhaps others like herself join in later. All seems well until Petunia the pet goat gets out and Angie goes chasing after it as Petunia leads her to the canning shed and a dead body! Wanda is holding the pie that Rachel gave to Wanda not long ago, partly eaten! Angie knows her Amish friend Rachel would never kill Wanda, but it isn't looking good as many have seen her and her husband Aaron arguing with Wanda over a pie factory proposal for town. Wanda,adament that the factory would deter from the charm of the town, while Aaron's livelihood is at stake. Any book with a goat running amuck is on my favorites list! Such character these guys have and even better sleuthing skills. 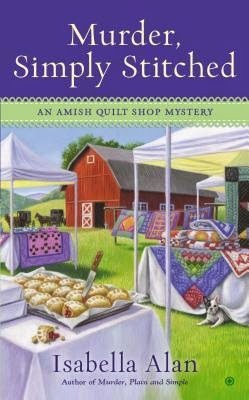 Good clean country fun including the ways of the Amish through baking, quilting, sewing, and fellowship. Angie sleuths away trying to get her friends off of the suspect list, much under the radar of the handsome sheriff who seems to have a thing for Angie. The country charm and a little bit of romance will keep you reading to find out who killed Wanda and why in this fun cozy mystery! Isabella Alan is the pseudonym for Amanda Flower. Amanda Flower, an Agatha-nominated mystery author, started her writing career in elementary school when she read a story she wrote to her sixth grade class and had the class in stitches with her description of being stuck on the top of a Ferris wheel. She knew at that moment she'd found her calling of making people laugh with her words. Her debut mystery, Maid of Murder, was an Agatha Award Nominee for Best First Novel. Amanda is an academic librarian for a small college near Cleveland.